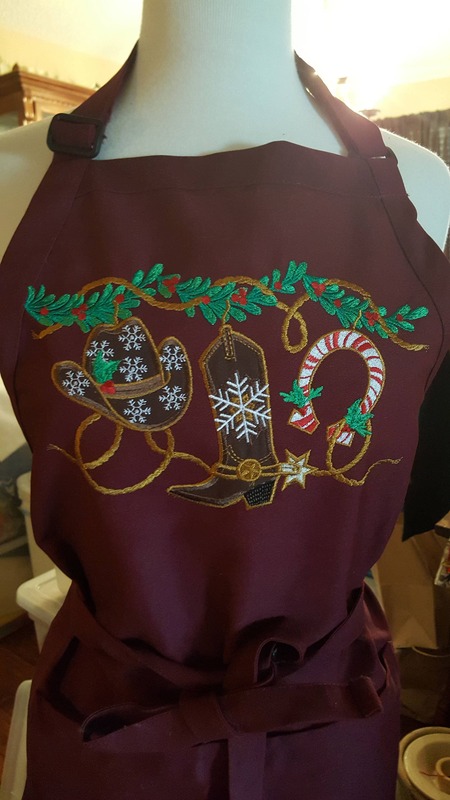 Heavy duty premium classic bib apron embroidered with Holiday Texas/Western design for that special person to stand out on that special Holiday grilling or barbecue occasion or holiday gifting ideas. Since our products are made to order, please allow 7 to 10 days prior to shipping. All purchases will be shipped USPS Priority Mail unless otherwise specified by customer. Please note that coloring of embroidery may vary due to apron color and variations in color thread dye lots. Customizing is available at additional cost. Please contact our sellers shop using Etsy conversations for specifics and pricing. Unfortunately all customized products are non-returnable. Please note that colors may vary somewhat from actual pictures due to lighting and environmental issues. We strive to maintain the coloring of the item a close to the actual photo as possible. Thank you for visiting my shop. Special Touch Embroidery hopes we are able to provide products for you current and future home decorating needs.